A very short street which was probably part of the main route through the town before Palmerston Street was built. It bridges the join between Palmerston Street and Wellington Road and is little more than 100m long; the street passes round the back of the Dog & Partridge. 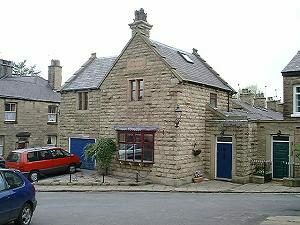 It contains a variety of interesting old stone houses. Approach off Palmerston Street, Wellington Road or Adlington Road. Nearest shops – further up Palmerston Street, further down Wellington Road. Nearest pubs – encompasses the Dog & Partridge. The Vale Inn is down Adlington Road. 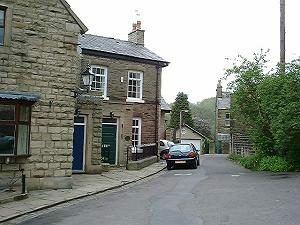 The little building (2nd picture) behind the Dog & Partridge used to be Bollington’s town prison! 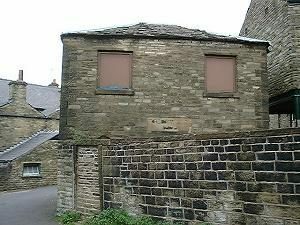 Bollington’s police station was close by on the corner of Adlington Road (3rd picture). The bridewell has its own page. 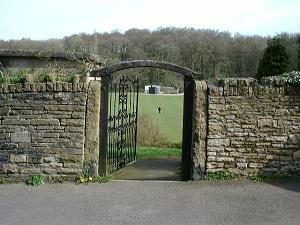 This is the delightful entrance from Round Gardens into the Recreation Ground. Just above the wall to the left you may see the roof of the air raid shelter, dating from WWII, but demolished in 2006 due to corrosion and decay.